Both sensors operate by measuring the amount of time it takes for a sent wave to return. This time is measured as a pulse width and then needs to be translated into a distance. Below are the averaged values and statistical fits that are used in the software. 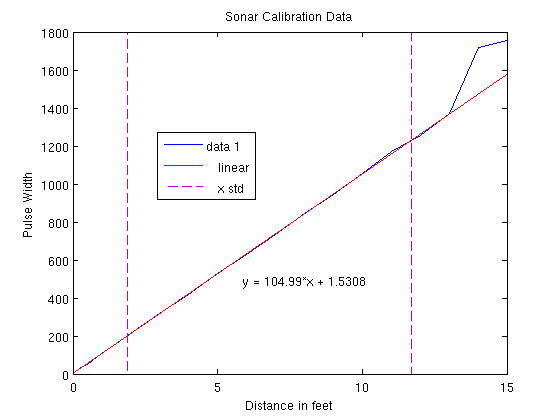 It's obvious that the sonar sensors perform linearly. 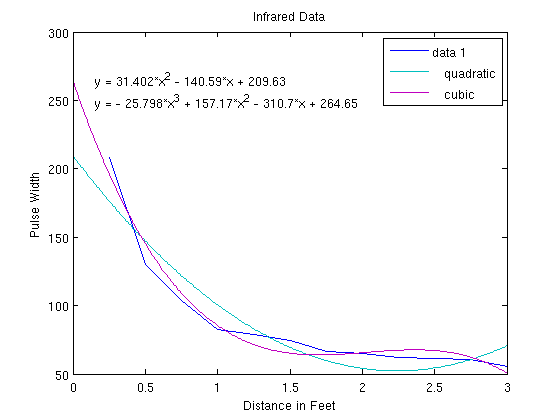 Values outside of the vertical purple dashed lines lie outside of the standard deviation. To avoid these errors in reading they were thrown out in finding the linear fit. The IR sensors are not linear as evidenced by the graph. Both a cubic fit and a quadratic fit were used so that either could be chosen.